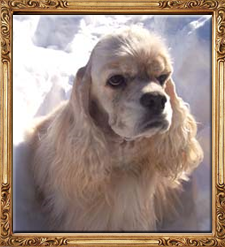 My little blonde American Cocker Spaniel was one of six puppies (3 boys and 3 girls) born to Trapper and Crystal. He was my very first dog after 21 years of waiting. Toby went everywhere with me, including six moves to new homes, three boyfriends and a husband! He was trained in obedience right up to the Utility level but because he was not registered, he was never trialed. He was smart and loyal and my bed buddy for 16 years, even sharing the bed with my husband. He learned to share with the new cocker puppy when I adopted Kyrie. He accepted Kryie's babies when they came into our life, and the fact that one puppy stayed with us from both her litters. And when they had babies, he accepted them too. He was 16 years old when Chelsey came to live with us and he even accepted her, though all he wanted to do then was sleep and she was such a pest. Being my first dog, I taught him to speak, to play hide and seek, to hold a piece of food on his nose until I said o.k. and then throw it into the air and catch it, to roll over, to shake a paw and to play dead. Toby loved to go for car rides and was an excellent swimmer. He passed the Temperament Test with flying colours. At 10 years of age he learned to play flyball and got his FD (flyball dog) title in one weekend. He also always opened his own gifts at Christmas time and was always willing to help the others open theirs too. In his teens he began to be hard of hearing and he suffered glaucoma and lost the sight in one eye. Otherwise he was a very healthy boy. Good, loving and loyal to the very end. 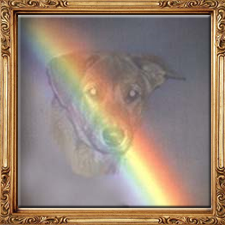 His body laid to rest under a tree beside the house, his spirit waiting for me at Rainbow Bridge where I hope we'll someday meet again … Goodbye my boy, I sure do miss you! "Ch. Kataxin's Kyrie She's An Angel CDX, FDX, TT, CGC"
I don't believe I'll ever love another in the same way I loved this little girl. Everything I asked of her, she gave me. 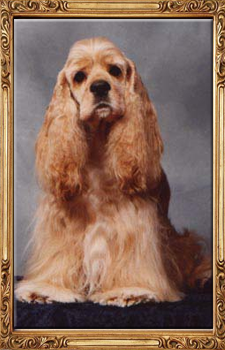 She was a Puppy Champion, got her CD title in one weekend with a high in trial at 17 months of age, and her CDX title followed within a year after that. She gave me two beautiful litters. I have a girl from her first litter and a boy from her second litter to carry on her name. She LOVED dog sports and got both her Flyball Dog and Flyball Dog Excellent titles in one weekend. She enjoyed agility too but at 4 years of age was forced to retire from dog sports due to Intervertebral Disk Disease. She made a 90% recovery but I wouldn't stress the disks with jumping etc. involved in Agility and Flyball. Kyrie had an awesome personality. She loved everyone, from small children to the old folks she visited in the retirement home. She got along with all other animals, cats and dogs alike. Passed her Temperament Test and Canine Good Citizen tests easily with flying colours. Even in her old age, she still wanted to do it all, but unfortunately her body gave out on her. This weekend we came to Dryden to celebrate my birthday with my family but it won't be much of a celebration. Jari helped me bury her under the tree on my property in Dryden, beside Toby. Rest in Peace my little Angel. My head hurts from all the tears I've already shed for you. It doesn't help that I have not slept in two days either. "Ch. 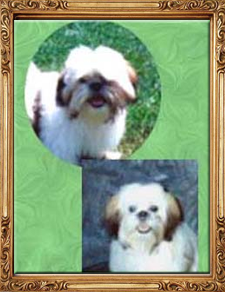 Dagobah's Haileys Comet CD, TT, CGC"
Hailey was the puppy I kept from my very first litter out of Ch. 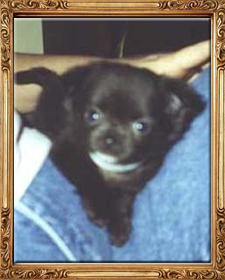 Kataxin's Kyrie She's An Angel CDX, FDX, TT, CGC and Am/Can Ch. Ashenafay Now There's Justice. 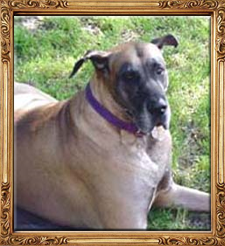 She was BOH to her Championship at 11 months of age, followed by her Companion Dog title at 13 months of age. She was bred once to Ch. Sarica Eclipse All Assets and although I didn't keep any of her pups, I put CD titles on three of the four puppies from that litter and a Champion on one and Flyball titles on two of them. 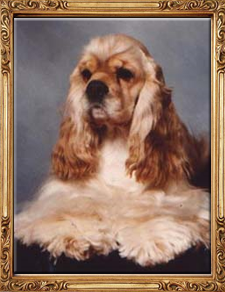 At seven years of age Hailey won Best Veteran at the Manitoba Cocker Specialty. Since then she has been my loved and spoiled couch potato who mellowed through the years. My head is pounding and heart is hurting as I said goodbye to her today. I wanted to bury her beside her mother but the ground is frozen so I had to have her cremated and I will bury her ashes later this year. I will miss her so much! 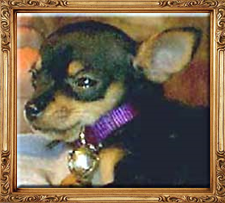 "Clinton Oak's Chelsey Dagobah CD, RA, CGN, TDI"
I still remember the day I picked Chelsey up at the airport, 9 years ago. She was the cutest puppy I'd ever seen. I had high hopes of showing her and breeding her but neither was meant to be. She did pick up three points as a puppy but she had conformation faults that made it hard to finish her. Didn't matter, she still had the sweetest temperament, so easy going, laid back and easy to live with. She never got into trouble and everyone that met my dogs always picked her as their favourite. Chelsey's health problems started shortly after a year of age. She never complained, suffered in silence and I spent thousands of dollars on her, over and over just to prolong this sweet little girl's life. She did have good periods of time but never more than a few months. My best memories of Chelsey are the year I was showing Kylie and trialing both K.C. and Chelsey in Rally. I was active with all three dogs and we were all happy. She had wonderful high scores in Rally too and made me so proud. This past summer I spent $1400 on surgery to have her eyes removed so she wouldn't be in pain but just four months later her immune system was just not strong enough to fight off all her health issues and I knew it was time to let her go. Knowing it and not wanting her to suffer did not make it any easier for me. I loved my sweet little Chelsey May so much. Rest well sweet little girl and say hi to Toby, Kyrie and Hailey for me. I miss you all. Another piece of my heart is gone forever. "Ch. Dagobah Kataxin Kaptan Cosmos CD, CDX, RN, RA, RE, FD, FDX, FDCH, FM, FMX, FMCH, ONYX, TT, CGC, CGN, TDI"
All his titles tell his story. K.C. was multi talented. An extremely hyper dog, getting into everything and always vocal. He was not an easy dog to live with. I had to channel his energy somewhere so I chose flyball. K.C. LOVED flyball. It was his forte. Obedience ... not so much. Although his CD came easily enough, it took me nine years to get his CDX. Sits and downs were his downfall. He didn’t have the patience to sit still for that long in one place. He, however, excelled at Rally, obtaining all three titles after his 12th birthday. 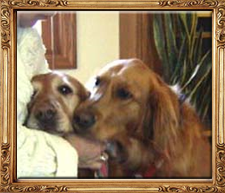 He was only bred once and lived to see his great great grandbabies brought into this world. K.C. never really started to slow down until after his 15th birthday. We had 16 good years together and I just wish the end was not always cleaning up the messes and paying huge vet bills to prolong the inevitable. At just under 16 years of age he underwent surgery for a lump in his mouth which he recovered from. At just over 16 years of age he started to become incontinent. Although not totally deaf, his hearing was no longer the greatest. He had lumps and bumps and warts all over but he also still had sight in both eyes. He developed a huge lump in his throat and started losing interest in eating. It cost me a small fortune to leave him overnight at the vet on intravenous because he became dehydrated. I decided not to put him through surgery again. This was not an easy decision for me because he had started eating again but the lump was very large and I did not want him to suffer so with much guilt and great sadness I helped him cross the bridge to join his mother (Kyrie) and sister (Hailey) where I hope he will find Chelsey and Toby who knew him in his younger years. Although his impatient whining drove us all crazy, the silence now is deafening. Rest in peace my KCman monster child. Life will never be the same without you. Tonight my heart has been broken into a million pieces. My husband let the babies out for a potty break and, since it was dark, couldn't see where they went. My beloved AJ, with her lion's heart, tried to chase away a stranger on a bike and didn't see the speeding car. It didn't stop and we found her lying on the road by the end of the driveway. As I cradled her tiny, warm body and kissed her still cold nose, she died in my arms. We will both miss her very much. I buried her in one of her favorite places in the yard so she can still be close to us and we can be close to her until we meet again at the Rainbow Bridge. AJ, we love you baby and will ALWAYS think of you with love. She was born May 7, 1992 and went to Heaven December 23, 2000. She was our little trooper!! She gave 150% and just got tired. We love you and miss you Sammie!! Love Daddy, Mommy and Tiffy too! Your sister Tiffy is doing ok but she misses you just like we do!! We all know that we wil be together again one day! 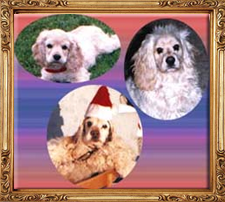 Muffins was born February 1985 and went to the Bridge on October 5, 2001. She loved to chase cats and bunnies and always thought of them as her friends. She will be missed but we know that she is feeling much better now. You were and always will be our baby girl, our love and our comfort. Thank God for the 7 years that we had together. We would never trade them for anything in this world, and knowing this make the pain a bit easier to handle. We know without a doubt that you knew that you were loved so very much, and I am so thankful that I was with you when you went across the bridge! So, wait for us our Princess Kayla, for someday, we will all be together. Though some may say it's "just a pet," I know I've lost a friend. A constant friend through joy or loss, with gentle loving ways. 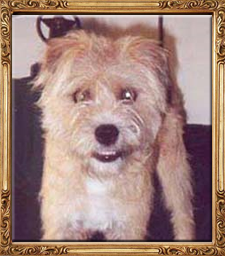 You'll live for always in my heart, my sweet forever pet. I love you so much. "Sweet Dreams"
Here's a picture of our friend we love and will miss dearly. She enriched our lives and brought out the best in us. She taught us life is for living and families are for loving. Sundance, how will we go on without you? I can hardly breathe thinking that I won’t see that sweet face again. Lying in bed, I keep waiting to hear the sound of your tail wagging up against the bedroom curtains. You couldn’t wait for the day to begin. We would wake to see your long-nosed, cowlicked face, chin on the bed waiting for us to make any movement to let you know that the day was beginning. Okay… you were pushy, we know that, but we always counted on you being there! We have talked so long about your illness and your high maintenance, but we would have gladly done it forever if there had been any hope of a quality life for you. We won’t miss all the pills and having the vet’s phone number on speed dial, because it was a constant reminder that your time with us was limited. We will miss the way you laid all over Emma whenever she laid down anywhere, the way you crawled up on your Dad’s lap from the time you were a puppy until you weighed over 70 pounds, your wagging tail whenever you stood up, chasing the ball in the house, carrying my gardening glove around whenever I was outside working in the yard, sleeping with your head on Dad’s feet, stalking Emma, retrieving socks and shoes just for the attention, your curly blond hair constantly getting curlier, that ridge down your nose that kept getting longer as you got bigger, and your excitement for going on the boat or riding in the car. You were our little “Pissant”, Sunny, Sundancer, sweet, lovable Sundance. We love you and will never forget all the happiness you gave us, Sundance. I cannot believe you are gone forever. This is our MUCH Loved Snookums. He was Born 9/11/89, and we just lost him 11/9/01. We got him 2 weeks after we were married, and he has been the best little dog in the world. He went through a lot with us and even accepted my daughter wonderfully into the family 4 years ago after HE was the KING for sooo long. He came down with Cushings Syndrome in October, and went totally blind one night. We were about to start the Doggie "Chemo" for him but he was so miserable we felt it was unfair to put him through so much now. We miss him dearly and think about him often. He loved to go for car rides and walks on the beach. Life isn't the same without him. 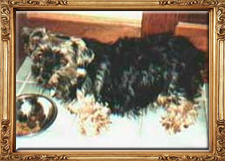 But we did get a new puppy, another yorkie, last week and he was born Sept 11 2001 ... so they have the same birthday. We felt it was meant to "BE." Have fun at the Rainbow Bridge Snookums ... we Love you and miss you so much. This is my precious "Sweet Boy Jake". He was born on Dec. 5, 2000. He was the best dog I have ever had the pleasure of having. He was smart, loving, protective, fiesty and had more human qualities than any other pet I have had. He gave me great comfort during a very difficult time in my life. He was very entertaining and everyone who met him, loved him. He never asked for anything in return. Unfortunately Jake developed Parvo when he was 10 months old. 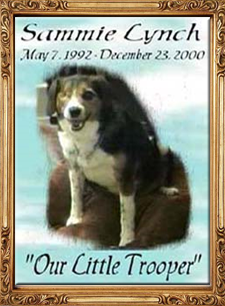 He went to the Rainbow Bridge on October 16, 2001. Since then, a huge part of our lives is empty. We love you and miss you Jake.